He was tired of reading about history, fifteen-year-old Harman wanted to experience life, but as his grandmother would teach him, sometimes history forgets the details, sometimes it forgets to feel alive and sometimes those you least expect to be part of history made the greatest impact on the present. And that is when Grandmother Jane told Harman the rest of the story, the story of the power one person can hold to change the future while making history. Lyra’s life changed after that terrible night that sent her fleeing from evil. It would be a night that brought out the person she was meant to be and would set her on a tumultuous path of adventure, daring and danger. She would learn to stand for what is right, to question and to never be afraid to do what must be done to thwart evil. With the powerful magician, Cal, by her side, Lyra will become an unsung hero and while Cal and Lyra will separate, there is no doubt of the bond they have formed and that Fate will once again bring them together. Meanwhile, Lyra’s life will be uprooted time and again and she will have to rely on her wit and the friendships she has formed throughout the years to survive, all the while unknowingly creating a legacy that will change the world. Fabulous writing, times of high peril mixed with times of quiet and some incredible magical inventions, we witness a blossoming of a strong character, strong bonds and, like young Harman, we feel history come alive as the blanks are filled in, truths are revealed as the legacy of one girl changes the future of her world. From the first page, I was submersed in Lyra’s world, through her teenaged moments of daring to the young woman who could become like a chameleon, adapting to every situation. Wonderful characters abound as each scene comes to life, some sweet, some adventurous and some magical, Jeffrey L. Kohanek has the gift of storytelling for sure, just like Grandmother Jane! 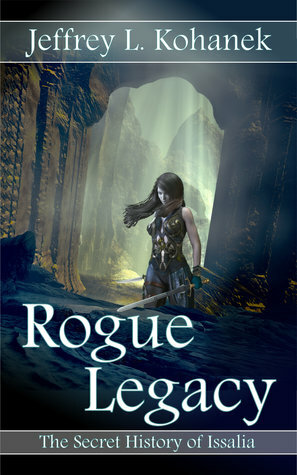 ROGUE LEGACY by Jeffrey L. Kohanek is the story of a girl who met Fate head on and created her own destiny as a strong, intelligent warrior who will forge ahead into the unknown setting the stage for the future and the Runes of Issalia.